Caravãna Sun release new single ‘Come Back’ – Spotlight Report "The Best Entertainment Website in Oz"
Currently winding up their HUGE 21 date European tour, Sydney four piece Caravãna Sun, have wasted no time in announcing the release of their new single Come Back (out August 17) from their hotly anticipated EP Silver Linings out September 14. 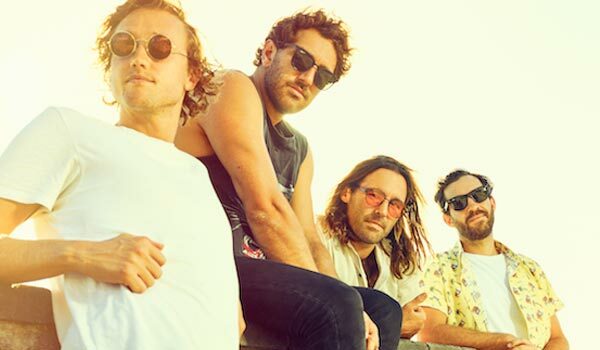 Keen to continue playing to the masses, these indie surf rockers have also announced a 15 date Australian tour kicking off in mid September with a variety of headline and festival slots including Wave Rock Festival in WA, Under The Trees Festival in Boyne Island and Celebrate Gold Coast on Chevron Island, both in QLD. Their latest offering, Come Back is a beautiful ode to a friend who sadly lost his life in the ocean, surfing the reefs of Indonesia, Jae Hayden. Dedicated to Jae and those lucky enough to have known him, Come Back is a little more subtle than previous single Beauty and The Pain, however it’s still got that same memorability, the same energy and the same musicality that fans have come to expect from Caravãna Sun. The Silver Linings EP, recorded at Sound Park Studio in Melbourne, with renowned producer Stephen Schram (Paul Kelly, The Cat Empire, San Cisco) sees the band draw upon the personal connections within their lives; in love, perception and ultimately death, providing a full body experience release of dancing and self-reflection. It is a clear and eloquent collection of six songs, each with saturated guitars, driving percussion and thoughtful lyrics, providing that endless summer driving soundtrack. Good Things Festival Announce Huge Line-up!